There are few bands where you can actually feel their sound in the pit of your stomach. Legendary San Jose stoner metallers Sleep are one such outfit. 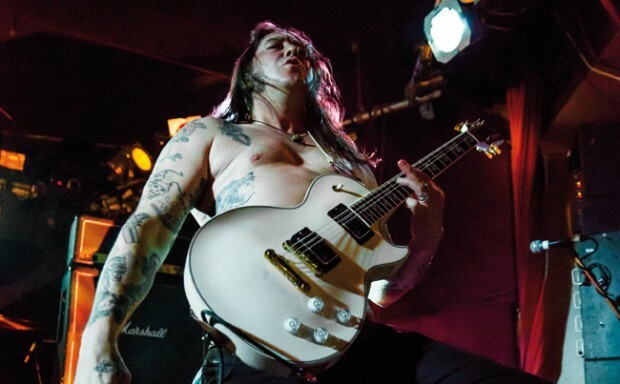 Although certain members of the band had played in Perth before in different projects – most notably OM and High On Fire – this was the first chance many of us were gifted the chance to see Sleep on home soil. But first locals Bayou had the opportunity to open for these Californian greats. Creating waves earlier this year with the release of their debut full-length, these boys are heady proponents of the southern sludge genre. Although a popular choice for many up-and-comers these days, this five-piece hearken back to the glory days of Grief in ’94 – with animal sound samples, gritty vocals and crushing guitars in tow. Definitely a little bit different from the normal fanfare. The Devil Rides Out has had a rollercoaster of a year. And it’s hard not to appreciate just how far they’ve come. Ugly Creatures, the band’s latest EP, reveals an even darker side to this doom ’n’ blues ensemble, one which has seen frontman Joey K spew his soul for audiences more than ever, with the band landed some pretty high-ranking supports in the last 12 months. Tonight was no different. Following the headliners to Sydney as part of the touring bandwagon, The Devils were well greased for their hometown show – playing a set that treaded between moments of lucidity and madness. New tracks like Empty Sky were slotted between older picks like Mean Season – with the churning guitar rhythms of Andrew Ewing and drummer Nathan Sproule driving their set to that sweet moment of revelation. Seeing Sleep live was an experience that many of us thought we would not see within our lifetime. Another notch in the growing Life Is Noise touring belt, bringing Sleep to Perth after their widely publicised stint at Melbourne’s Release The Bats festival was a coup in itself. But all the hard work was fully realised when the sound of that first riff from 2003’s Dopesmoker hit. You could literally feel the vibration travel through your entire body. The trio, fronted by bassist Al Cisneros with guitarist Matt Pike and drummer Jason Roeder (Neurosis) treated the Rosemount as their very own studio – shutting out the crowd and just jamming their way through a full hour-and-a-half set of tunes. Working their way through favourites Dragonaut and The Druid, the band even gave a glimpse of newer material – with the hard-hitting rhythms of Magnatar getting some airplay. But it wasn’t until the quieter moments, when the music was given time to build, that we could really appreciate the less-then-delicate nature of Sleep’s art – it’s all in the dynamics, with Holy Mountain’s From Beyond leaving a lasting impression on the ears for days after.